Ignacio Castillo, General Manager and Founder of Demsa Consulting. 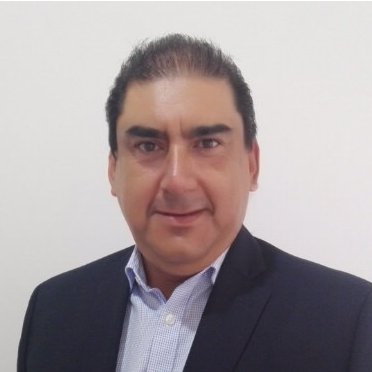 Today we are going to speak with Ignacio Castillo, General Manager and Founder of Demsa Consulting, a company located in Mexico that helps its clients to implement tools for the measurement of strategy using Balanced Scorecard methodology. … we should not make a large number of indicators to achieve an objective, since in the end we will focus only on measuring and not in complying with the strategy outlined and its objectives. Ignacio Castillo. Aleksey: You created DEMSA in 2003. Why did you decide to work on the strategy subject? Ignacio: First, I will tell you that I work in this because I lived as an employee. The problem is working in a company without strategy, and later, this same company decided to implement it and measure it, and I could see the enormous difference that exists in a company that only endeavors to work for financial results without thinking that these are the effect of many causes. Aleksey: We can see that there is a lot of interest in Balance Scorecard methodology in Latin America. Which companies need a Balanced Scorecard? How can you describe a profile of your customers? Ignacio: I am convinced that the companies that most need to implement the Balanced Scorecard methodology are small and medium enterprises (SMEs). The profile of the clients are small and medium sized companies that have an organizational structure, in other words … they have well defined the hierarchies and the roles of the collaborators. They also have a strategy or at least a SWOT analysis that allows them to know where they want to go and how they will do it, and this allows us to implement the Balanced Scorecard methodology. On the other hand, if the company does not have a strategy but knows where to go, we help to develop it and of course to measure it. Aleksey: How do you see the situation with the subject of strategy in Mexico? In the context of strategy … what is the most urgent problem that organizations must solve? Ignacio: The most serious problem that I see in my country is that the strategy is only managed in the top management of the company. I always say that the companies have two worlds, the corporate and the operational, where the former does not communicate its strategy to the second one. Therefore, they do not have their objectives connected and as a result, it is a company that does not advance because each side pushes in a different direction. Aleksey: Although Balanced Scorecard is a methodology to execute a strategy, there are many organizations that focus on their measurement part (e.g. indicators). What do you think about this situation, what do you recommend to your customers? Ignacio: That is true, at the beginning most of the clients with whom we worked understand the situation that way, but as we develop the implementation, the perception changes, and they now can see what the strategy is measuring through objectives, goals and indicators. The recommendation is to understand from the beginning that the indicators are neither objectives nor goals, and you must go deeper into the subject and be very clear with your clients. 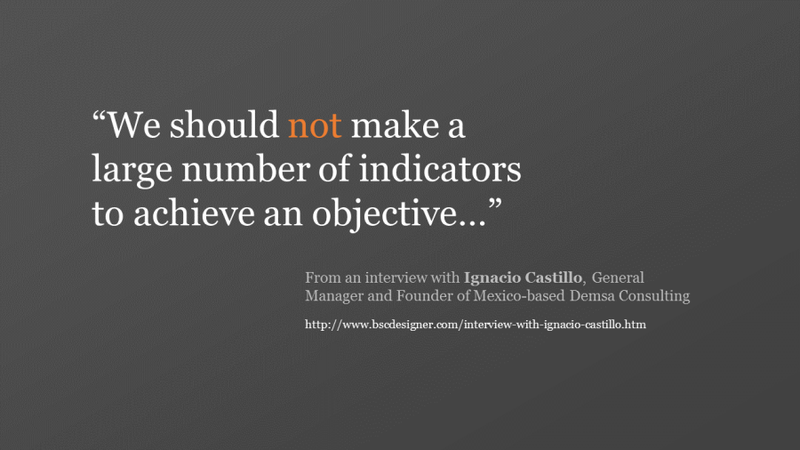 An indicator is a generator of results for a goal. Another recommendation is that we should not make a large number of indicators to achieve an objective, since in the end we will focus only on measuring and not in complying with the strategy outlined and its objectives. An indicator is something that can be counted and compared; it provides evidence of the degree to which a goal is achieved for a given time. This last explanation shows that you have to work hard to implement a BSC. Aleksey: There are 6 steps on the DEMSA website to deal with strategy problems. How do they work? Ignacio: Basically, we find the steps to implement the methodology here, it is clear that within the evaluation we can find out if a client is ready for the implementation of a Balanced Scorecard or not. Aleksey: Step 6 of the process is automation. I suppose that among others, you recommend our BSC Designer software… For what kind of clients is this solution recommended? Which version do customers prefer in Mexico, in the Cloud or desktop? Ignacio: I must say with great pride that the only tool we work with is BSC Designer and we implement it with all our clients, and the version they prefer is in the Cloud. Aleksey: In many cases the most difficult thing is to start. What can you recommend to companies that want to test Balanced Scorecard methodology? Ignacio: Let them investigate a little to understand the methodology, then they have to be willing to work in the implementation, and first of all, they should define their mission and vision. Aleksey: How can your customers measure the success of the implementation? Are there any typical KPIs to confirm the improvements? Ignacio: It is measured by the achievement of sales and income goals, as well as the staff training hours, and customer service. Aleksey: What kind of business can DEMSA help in? How can they contact you? Ignacio: Business for small and medium companies. Our website is: demsaconsulting.com.